EF Mailbox Manager is a management program for as many as desired POP3 Accounts. EF Mailbox Manager can manage as many POP3 Accounts as you like. For periodical checking, polling time can be set individually for each account. You may check for new messages on a server and/ or delete messages on the server or download messages to a local computer for further use. Downloaded E-Mails will be saved in ascii text files and stored in mail boxes. Should you use Outlook Express or any other E-Mail program which open attachments automatically, you are strongly advised to open the message first in a text editor such as Notepad. With EF Mailbox Manager you may remove annoying Spam E-Mails on the server without downloading them first. Save connecting costs! If the mail server supports it, EF Mailbox Manager can be configured to use safe connection (APOP). Thus passwords will not be transfered through the Internet while logging in. 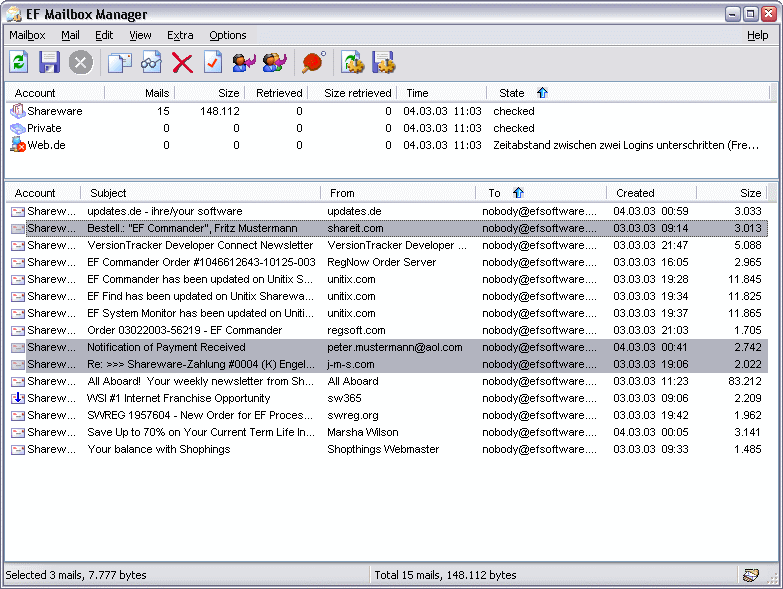 Several functions of EF Mailbox Manager make use of the installed standard E-Mail client to create or answer messages. The following languages are included in the package: English, German, Bulgarian, Catalan, Dutch, French, Hungarian, Italian, Romanian, Russian, Spanish, Swedish, Ukrainian.